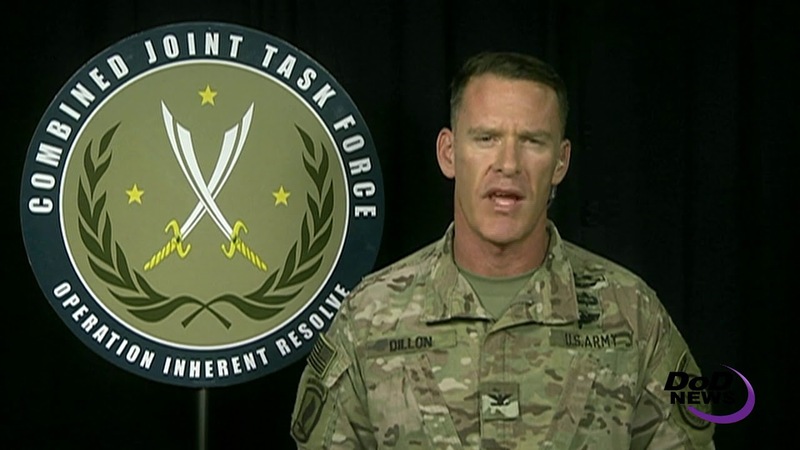 Progress is steady in the fight to defeat the Islamic State of Iraq and Syria, as Iraqi security forces push ahead to eradicate the enemy from Iraq, Army Col. Ryan S. Dillon, spokesman for Combined Joint Task Force Operation Inherent Resolve, told Pentagon reporters today during a news briefing live from Baghdad. Clearance operations in around Tal Afar continue, the colonel said, and the ISF have defeated pockets of remaining ISIS fighters mostly north of Tal Afar. “The handover to hold forces in cities and towns of northern Nineveh [governorate] continues as the ISF prepare for their next offensive to defeat ISIS,” Dillon said. He added that remaining ISIS holdouts in Iraq include Hawija and a cluster of towns in western Anbar. “The coalition will continue our support to the ISF with training, equipment; intelligence, precision fires; and combat advice,” he said. The ISF have worked tirelessly on a humanitarian level, too, by prioritizing the evacuation of those civilians who are trapped by ISIS. “They have planned, and positioned personnel and assets to screen, receive and transport [internally displaced people] to camps,” Dillon said. In Mosul, stabilization continues as federal and local police and tribal forces conduct security operations in the eastern and western parts of the city, Dillon said. Residents also are working with local and national government institutions to clean up and return essential services to the city. Syrian Democratic Force partners continue the fight to eliminate ISIS terrorists throughout northeastern Syria, the spokesman said, noting that fighting in Raqqa is in the center of the city where the SDF cleared 35 blocks this week. “The SDF now control 63 percent of the city,” he said. “The SDF have encircled the stranded, desperate ISIS fighters near the national hospital -- one of the many protected sites ISIS regularly uses to base their operations -- and the main stadium,” Dillon said. The SDF have cleared several neighborhoods in the southwest part of Raqqa and continue to clear important infrastructure in the east, such as buildings, tunnel systems and landmarks, he said. While the SDF make steady progress, the improvised explosive device threat in Raqqa remains the most-challenging obstacle, Dillon said. “Our partners work tirelessly to clear these explosives deep in the city's center where ISIS has had years to prepare for this battle. SDF fighters describe this struggle ‘as much a fight against IEDs as it is against ISIS’ with the sheer quantity of improvised explosive devices far exceeding anything the SDF had seen previously,” he emphasized. Meanwhile, the SDF is conducting clearing operations against ISIS in the Khabur River Valley, northeast of Dayr Az Zawr, Dillon said, noting that the forces met with light ISIS resistance while clearing nearly 400 square kilometers -- more than 150 square miles -- of territory. Across Syria, about 1.5 million people are free of ISIS control and 42,000 square kilometers -- more than 16,200 square miles -- have been cleared, in the ongoing fight against ISIS, he said. “We still expect tough fighting ahead, but with our partners’ battlefield successes, increased capacity, and continued support from a 73-member coalition, we will keep the pressure on until ISIS is defeated,” Dillon said.